A man with a secret past and a woman with an uncertain future. When Lucinda Farrell is found guilty of a crime she didn't commit, she's resigned to her fate. It's either stay on a dying Earth or travel through the galaxy to the new world of Solitaire to complete her three-year sentence. Many claim the space bucket, Earth Ship Siren, won't make the long twelve-month journey and are almost proven right when a micro-meteor shower hits and cripples one of the three ships heading to Solitaire. As pilot of the ES Siren, Jarred Cooper has never been short of female admirers. But he's got a secret he holds close to his chest—literally. Letting go of his past has never been so difficult when he's yet to find a woman who makes his breath catch and his heart beat fast. He knows love at first sight doesn't exist. Then he glimpses the beautiful prisoner, Lucinda. But when overcrowding and rationing of food become serious issues, getting her to understand they can make things work, despite his past and their huge social divide, just might be the biggest hurdle of them all. 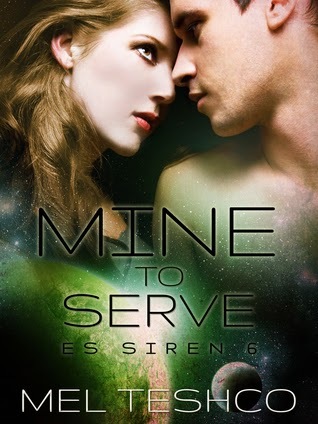 Again, another good novella in the ES Siren series. I continue to be impressed how Mel Teshco, Denise Rossetti and Shona Husk can write a series that remains so seamless from one to the next while each brings her own style to her contributions. My biggest concern with this one, as with others in the series when the prisoner is a female, is the power imbalance. As one of Siren's pilots, Jarred is at the top of the food chain while Lucinda serves this part of her sentence doing laundry. For me, even their respective pasts would not have been enough to balance things out. Teshco tells their story mainly from Lucinda's point of view and when we see Jarred's side, it's all about her. I loved how this gave her voice power she lacked due to her position aboard. I needed her to feel strong and to believe in herself in spite of her situation. I needed her to be a woman who felt free to make as many choices as she could within the constraints she lived in. Very much enjoyed this one and read it twice. It was in my second reading I came to appreciate the depth we needed (and saw in) Lucinda. I received a copy from NetGalley in exchange for my honest review.